The annual Italian food and culture festival, Festa Italiana is gearing up for the 21st time. 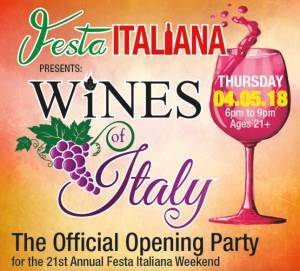 This years’ festivities will begin with the official opening party, Wines of Italy, which gives guest a chance to taste over 80 wines from Italy and California along with fine Italian food, entertainment and a silent auction. Purchase tickets to the opening party by clicking here. The free family-friendly portion of the festival will be taking place Saturday, April 7th, 2018 from 10 a.m. to 10 p.m., and on Sunday, April 8th, 2018 from 11 a.m. to 6 p.m. in Ybor’s Centennial Park.